As a dentist, your practice survives only so long as you are able to attract clientele. That means marketing your practice to as many new patients as possible and continually striving to grow your potential clientele. In today’s world, that means incorporating the internet into your dental marketing strategy. How Are You Currently Marketing Your Dental Practice? Before you pursue any changes to your dental marketing strategy, you first need to evaluate what your current efforts are. If you have yet to create a digital marketing strategy, now is the time. Dental marketing in the digital world requires more than most other types of marketing strategies. In fact, that is why many dentists look to professionals, like those at 51Blocks, to help them promote their practice as efficiently as possible. We will talk more about that later; right now, however, we want to look at how you can best plan your digital dental marketing strategy yourself. It starts with defining goals. Having goals can help you to better evaluate the effectiveness of your marketing strategy. Goals should start out rather broadly if you are new to the online marketing world, and then become more focused as you grow in experience. Build a stronger connection with your local community. Attract x-amount of visitors to your new site each week. Encourage x-amount of interactions, such as video viewing or comments. The overall end-game for most dentists, however, are the “conversions”. For dentists, conversions will likely refer to a new patient appointment with your practice. However, the completion of a New Contact form, as well as referral calls to your office based on information obtained from your website, are also good ways to measure your success. According to Pew Research, roughly 59% of all U.S. adults use the internet as their primary means of health research. In addition to this, Google has also performed several studies regarding the importance of online marketing for healthcare professionals by individuals seeking their service. Almost 76% of those looking for healthcare support visit a hospital or private practice website before scheduling an appointment. Why does this matter? After you define your goals, you will want to budget for any potential fees you may need to pay. Consider these fees to be a part of your investment in your practice. If your marketing strategy is strong, however, you will have a high return on investment (ROI). Finally, you need to evaluate your approach. After all, there are plenty of different ways to market yourself online. From developing your own website to utilizing various social media platforms, there are pros and cons associated with all of your options. While studies prove that a practice should have a website, social media can help. Before you select a platform, however, you need to consider a few different factors. First, you do not want to spread yourself too thin. As a novice, aim for a website and one social media account. Second, you want to select a platform that reaches your intended audience. One way to do this is to look at what your competitors are using to help you evaluate whether a platform is ideal for you. Your website needs to provide visitors with a great user experience. This goes beyond simply slapping together a website. Before we get into how to create a great website experience for users, however, you need to understand the importance of Google ranking. Every time a user enters a query into the search engine, Google spits out a response in the form of listed websites. This is your Google ranking as it pertains to the particular query. The more relevant your content, and the better optimized your site is, the higher your website ranks. There are a great many factors that affect your Google ranking. In fact, Google is notorious for pushing algorithms that realign their ranking criteria frequently. However, a few factors remain a constant requirement for highly ranked websites. Search engine optimization, or SEO, is one of the most talked about tactics used to help a digital marketing campaign. SEO refers to several different ways in which your website caters to the user experience and Google ranking algorithm. Keywords: Keywords require a lot of time and evaluation. What you think may be a keyword people would use to find you, may not be as important as you had hoped. (To help, Google offers tools to help you evaluate and determine what keywords are best for you!) Keywords are most commonly referred to as short-tailed and long-tailed. Short-tailed keywords are general. They tend to bring in the largest amount of site traffic. (Example: orthodontist, cosmetic dentistry, etc.) However, because they are so generic, they do not always bring in traffic that converts. For higher conversions, you need to use the more specific long-tailed keywords. (Example: veneer cosmetic dentistry Lexington KY, TMJ dental options, etc.) These more targeted keywords bring in visitors that are more likely to take a serious interest in your services. E-A-T: E-A-T is short for “Expertise, Authoritativeness, Trustworthiness”. Your E-A-T plays a role in your ranking. List your credentials wherever possible. That includes at the beginning or end of blogs or articles you may publish. This helps Google to take note of your credentials and authority. In addition to this, your content should be relevant. Backlinks are a great way to get industry experts to help boost your ranking. Having quality backlinks helps Google and potential visitors to better trust your content. Scalability/Flexibility: Your website should be optimized for all browsers and devices. This includes desktop, laptop, tablet, smartphone, and other such device access. The format should be able to scale, remaining legible and easy to navigate regardless of how your content is accessed. Your website should also allow for potential growth, as your practice or site becomes more popular. Other factors affect your SEO. However, these three items provide a great start. A great website also benefits from the use of a secure hosting service. Your website will need to be hosted on a server. Google (and visitors) prefer sites that load in 3 seconds or less. (Several different tools are available to you to help evaluate your load time.) This means your host servers needs to be fast. In addition to this, it needs to be secure. Google, as well as your visitors, do not want to recommend or view sites that are not secure. Why? Personal data, such as email lists, patient information, home addresses, and credit card data have all been stolen via hacking attempts all over the world. Having this happen, particularly when it comes to healthcare, is seriously damaging and Google will punish you for it. Secure hosting can include everything from proper protective measures, such as malware scanning and backups. Finding a secure hosting company is essential to your website’s operation and user satisfaction. Having a great, user-friendly website is a start. However, in order to generate a steady traffic flow, you need to get that to where people can view it. SEO, secure hosting and other such tactics are great for Google ranking. However, they are not the only things that help boost your rank and get you featured amongst the top results. Word-of-mouth is a great way to self-promote your website with little, to no, actual investment. 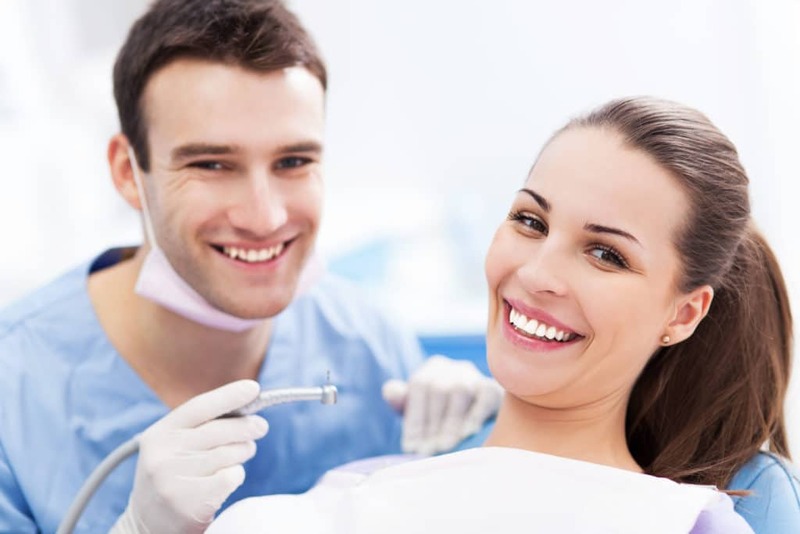 Satisfied patients will gladly refer you to others in their personal life and community. However, word-of-mouth is not always the most reliable way to advertise your website or services. Pay-per-click advertising, or PPC, is another means of marketing your dental practice but it takes financing. You may be more familiar with PPC than you realize. Have you ever visited a website that has ads featured on the top, side, or bottom of their content? These are PPC “display” ads. (They are commonly featured on Facebook as well!) By paying for a display ad, you are able to redirect traffic back to your own website. PPC ads are relatively low-cost, often bringing in a lot of traffic for pennies. Local SEO is a great way to increase your local Google ranking. To help your local SEO increase your local Google ranking, you need to ensure all information is up to date. If your practice moves, changes operational hours, or gets a new phone number, update your Google My Business page to reflect these changes. High-quality photographs of your office can also help visitors to find your practice. Recent, positive reviews are important too. Encourage happy patients to leave these reviews to help boost your local Google ranking! At 51Blocks, we strive to ensure your dental marketing strategy is fully supportive of your goals. From marketing analytics to website development, the experts at 51Blocks are here to help. 51Blocks has the experience and skills you need to help you market your dental practice. We know managing a full marketing campaign can be extremely time consuming and overwhelming. When you hire 51Blocks, you have the professional marketing services you want when you need it. As digital marketing experts, our entire company thrives on tracking trends, statistics, and Google metrics to help your business succeed. If you are looking to improve your dental marketing campaign, contact 51Blocks today!